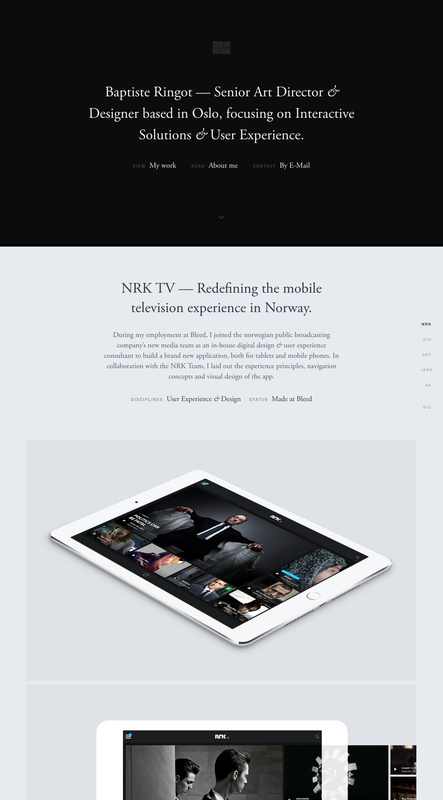 Stylish One Pager for Oslo based designer, Baptiste Ringot. The super long scrolling Singe Page website features a fixed right project navigation to smooth scroll between his work. I'm an Oslo based designer with over 8 years of experience in the digital industry. Always combining form with function, my practice finds its ground in simplicity. I work from the core of user experience to the latest visual details, all of which would be impossible without solid processes & enthusiastic team work. I am, in addition, the proud recipient of several professional awards and nominations.